Well for us it is because this way we’ve discovered that we are saving both money and time and we’re also improving our health by planning ahead and eating at least 3 healthy meals a day. Initially two people who didn’t plan household activities much, we’re now both realizing that better planning will pay off and help us achieve our personal lifestyle, business and saving goals. And the ultimate goal will be to get to spend more time with the family. Or just to get extra time for us, for exercising, relaxing and researching into our topics of interest. My husband and I plan to buy a property in the next 2 or 3 years, so being aware of where our money goes and trimming our budget is a huge advantage to actually reaching this goal. To start, we’ve observed that every time we go to the supermarket with no plan, we end up grabbing random stuff just because it’s on sale, with no plan for how to cook or eat it. Or even worse, we’re getting sweet or unhealthy things because we are hungry. Simply reducing these visits and being intentional over the monthly meals is a game changer. First of all – huge savings. Second of all – so much time that we get to choose to distribute in other areas of our life that need our focus. Plus, an extra bonus on the personal kick of happiness I get out of the system that is set in place. I will go a bit in depth about my experience with the importance of structure, routines and systems for overall wellbeing on future posts. But waaait, that can’t be, how do you handle fresh products? Well, we actually go only once a week for those at our local Aldi store. That is mostly on Saturday evenings after 18:30 – you’ll see more below on why particularly Saturday. But we buy all other products once a month. However, I will not go alone for the fresh stuff, but with my super, super focused husband, who has it much easier to stick to the initial plan. Which is – buy JUST fruits and veggies. Simple, right? Mneah. For me personally, not so much. I have also set up a budget of 15 euros per week for this weekly spree. It is enough for fresh salads, bananas, apple, clementines, watermelons, nectarines or whatever is in season, plus fresh milk and bread for the week. That is 45 Euros a month. Aaand we will make a stock of meat if it’s on some super-duper sale that Saturday and this goes out of the monthly budget. We used a cash envelope for the monthly shopping, where we’ve initially put 250 Euros for the main grocery shopping and 45 Euros for the 3 weekly fresh product trips. Plus 100 for extras, like toiletry and baby things that I get from the drug store. This is a game changer, just because it is soo easy to track. You can store all the receipts in this envelope and write down each time (each week) what you spent. I put in this envelope as well all of the other receipts throughout the month, so at the end, I know exactly what I have been spending that month besides the monthly grocery budget. First of all, I highly recommend you take your time and check out what you already have. In the pantry, the fridge, your cupboards. Organize everything, let go of things that are too old and make an actual list of what you have. All of it – write it down! Look for anything that might need eating in the near future or things you have in excess and before starting the list, make sure to research some meals with those ingredients. You can go to www.allrecipes.com for this and research recipes by their list of ingredients. If you can cook and freeze some of what you already have, even better, you can cut it out of your initial shopping list and save up. This procedure must be repeated every month before the general shopping. This way you avoid doubling a product or buying more stuff without using the ones you have at first – a mistake I have done soo many times. For this step, you will have to… PLAN, you guessed it! You might dread the planning part, I know. If so, I would not recommend starting with a very diversified monthly meal plan if you are a beginner to the planning part. You might feel a bit intimidated and demotivated by the initial complexity. Perhaps a weekly plan and shopping list are a better option for you to try at this point. Here is a free printable that you can download right below. This one is best for getting organized initially. 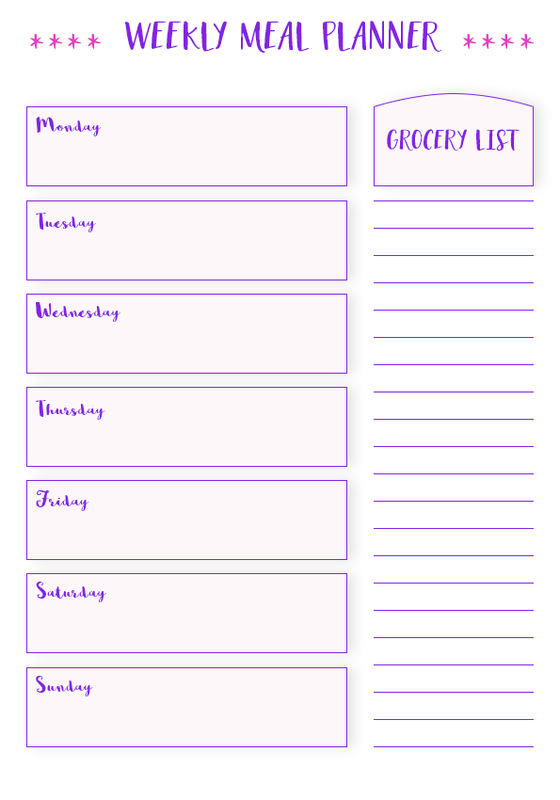 It is an easy two-column template, where you can keep your weekly menu and grocery list. Weekly Meal Plan and Grocery List Template – download here. If you have already tried the weekly method and want to clear up more time, here is how I tackled the problem so far. When I make the plan, I want to have a menu plan for the whole month in the end, even if it’s a few dishes that repeat themselves. I personally just plan enough meals for the month but don’t strictly plan which days we will eat those items, I enjoy the flexibility. Firstly, I look on Pinterest and at my bookmarked favorite food bloggers during my baby’s nap. I own exactly zero physical cookbooks because hey – this is Digital Train after all. I mark every recipe I’m going to use in a Pinterest board and then put them down on a big piece of paper, together with the ones I already know we like. I’ll gladly share some of my favorites tested recipes along the way. I’ll just have to put them all through my lazy/easy/tasty/healthy filter. I’m thinking about making a file with our favorite recipes over time, so I will consider printing them out at one point to make them more accessible. For shopping, I use a master grocery shopping list, where I bundle everything together. Here below is my template for monthly planning and shopping which you can also download for free and use. 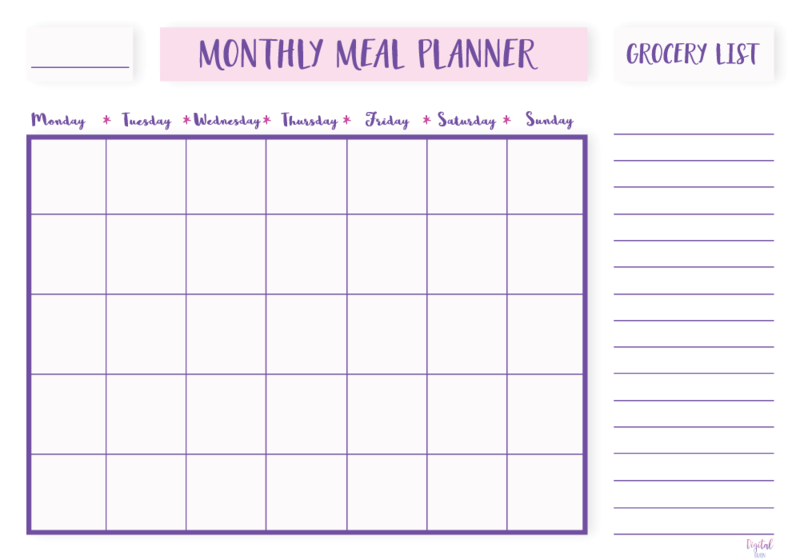 Monthly Meal Plan and Grocery List Template – download here. So, this is how it will look like in a week. I will typically prepare breakfast fresh, everything under 10 minutes will do. But I also have breakfast dishes in the freezer as well. I have a list here with high protein breakfast ideas that are not eggs. I super recommend you read here more if you want to know more about the importance of breakfast and having protein for breakfast. I will also prepare fresh burgers once a week, or some baked potatoes with parmesan. Or just something easy and fresh that needs no more than 10-15 minutes of my attention. The 7th-day meals we will pull out something we already have in the freezer from the previous weeks. 2 types of Instant Pot soup for lunch, which we will have 3-4 times a week. The other 3 or 4 times I will make fresh things like burgers – it takes me 10 minutes. Or I pick some fast lunch ideas from this super list of 200 Healthy & Cheap Lunch ideas, which is really all you could ever need to get started. The 7th meal might be something we eat out one evening. 2 types of instant pot soup for lunch, 3 to 4 times a week. Same thing as above, I will make some fresh things like burgers, salads, something I have already picked from this super list of 200 Healthy & Cheap Lunch ideas. For now and for us, I just repeat these 2 weeks twice in a month, as I find it much easier and we are super ok with repetition. But you can also pick up 6 other recipes and make week 3 and 4 different if you don’t like having similar things. I shop for everything and cook the above recipes in 2 big batches. In the First batch, I’ll make the breakfast freezer items, 3 of the main dishes and 2 of the soups in a maximum of 4 to 5 hours. Then in the second week, I will do the second batch, that the remaining 3 dishes, the breakfast freezer and 2 of the soups on my list, also in 4 to 5 hours. So 9 to 10 hours for more than 2 weeks of cooked food? That’s pretty good I would say! For me, it cuts the time to more than half because I really only need to clean up once after cooking. Now I know this is a lot and might seem intimidating, but it is the best way for us so far. And it really is much easier than you might imagine. The process we chose so far gives us flexibility and the peace of mind I get from having a month’s worth of meals to choose from. Look out for items on sale or use your coupons and discounts if you have any. In Germany where we currently live, there are several discount options, but for sure similar principles apply to your region. Those marketing people really work overtime to lure you into their chain store with the best offers. Here, for example, I have downloaded their major apps on my iPhone. I can access the weekly offers and app coupons from Aldi, Lidl, Rossman, Dm in no time. Paperless is the way to go for me. Rossman and DM are 2 chains of probably drug stores in US terms. I have 10 percent discounts frequently on all their products and that is really something to make use of. Especially if you bundle all of the major shopping to once a month, you will end up seeing that you are indeed saving a lot. The app keeps track for you on the total amounts you save. So do spend some time crossing interesting products and go get them. I personally don’t really use coupons unless they offer a percentage discount to be fair. That is because I find it quite complicated and they usually don’t apply for the products I am interested in. But if you find good offers, it’s something to check out. I observed that here Saturday evening is the best time for shopping. In Germany, Sundays all shops are always closed, so it makes sense that Saturday evenings is when you get most discounts on major products. Especially fresh produce, dairy and meats. I’m considering going on Mondays as well to test the discounts. Check out your area and try to figure out when is the best time for you to go. and do let me know if you have some tips on this one. If possible, try not to bring kids with you, so you can be both efficient and focused. Bring grandpa, grandma or your friends to watch out for them and go with your partner or by yourself. Just make sure you get some help with carrying of all that shopping, as there will be loads of stuff. Buy in bulk if you see major discounts on products that can be stored in the freezer or pantry for a longer time. Reach out way in the back and you’ll find products with a bigger lifespan. Really, just try the milk section next time and you’ll be surprised. Don’t buy brand products unless you know they are worth it. Honestly, the supermarket chains’ generic product will do just fine, I’ve tried and tested and trust me, there is little to no difference in taste. I found that the 0.39 generic spaghetti is pretty much the same as the 1, 59 Barilla spaghetti. So no more no5’s Spaghetti for a while, Barilla, sorry. I will stock up on all the Barilla Sauces I can find on sale in Aldi or Lids, because in this case, so far nothing compares to this taste, in my opinion. Check out the bottom shelves, that is typically where the best prices are. Consider always adding to your list products that are long-lasting. Find out what some of these are in my article on long-lasting foods here. Stay out of the sugary stuff, it’s super bad for you and charges your bill like you can’t imagine. Try some healthy or more or less healthy options, like fresh fruit or popcorn. Oh, or dark chocolate. I’m not suggesting you get kale chips, that stuff sometimes tastes like dirt. But I do promise that if you are having cravings as we did, they will go away if you stick to a healthy 3 meal a day schedule. Prepare to go to several chains of supermarkets, as they all have different best products. Organize the products as soon as you come back home. Pull out what goes out fast in the front and use the perishable items for the recipes at the beginning of the month. Portion foods and freeze them. Yep, it applies to veggies, meats and every other item you might need to clean, peel, slice etc. So be realistic about the time you will need to organize. I usually do this right away and choose to cook in batches on Monday, so we can enjoy some family time on Sunday. Check out my article on how to freeze things properly. This is something you definitely want to learn more about, as it will change your life only for the best, I promise. Most important – wash before, portion as airtight as possible, label. What are some useful tips to help keep it simple and stay on track? Save your monthly grocery receipts in a special envelope – only for that month. This way you can easily figure out was how much of the basics you use, by revising the receipts at the end of the month. Check out how much your bread/milk/eggs/cereal/yogurt etc. your family eats and then you will know how much to buy for a month. Be prepared for mistakes and changes, this is how you perfect your own process. Keep an open grocery list all month long, somewhere visible, like on the fridge. Meal prep and freezer meals. Seriously, it’s everything. Last but probably the most IMPORTANT! 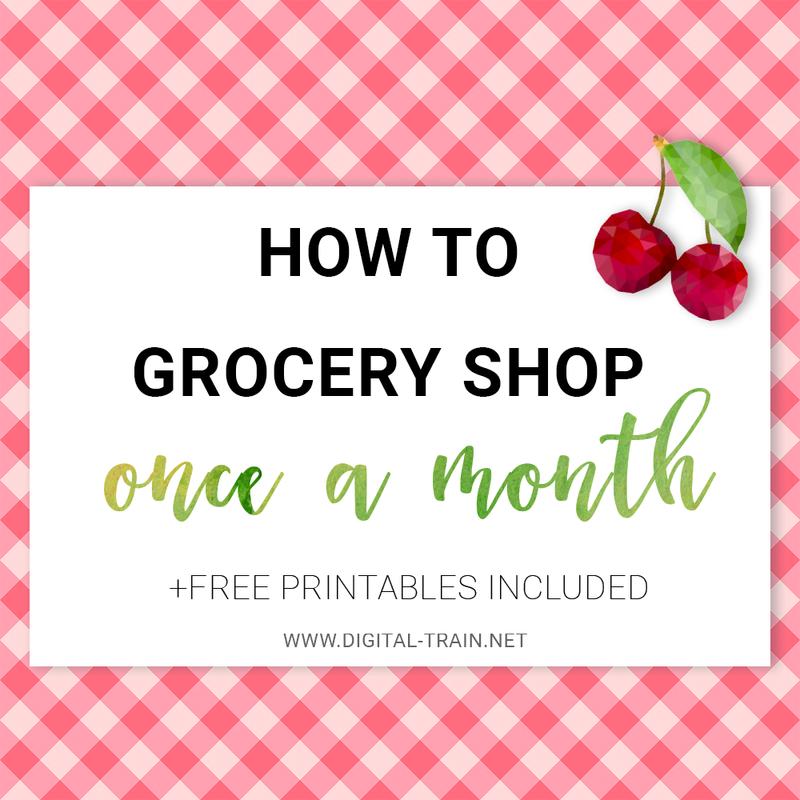 Save up the money you will save on grocery. Do you want to purchase a house, a new car, want to travel more? Anything you will save from cutting down on the food expenses – just put it away. After a few months of monthly shopping, you will even be able to automate a fixed amount to a savings account. If you stick to this routines, you will get extra money from this. And from personal experience, you might be tempted to splurge on other items once you see those cents rolling. So keep your eyes on your goal. For us, it is mainly for a downpayment on a property in the next 2 to 3 years. How about you?